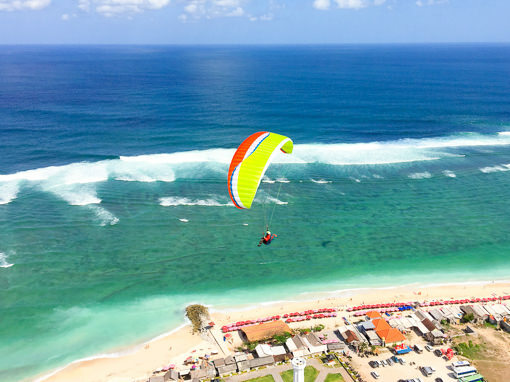 Why learn to paraglide in Bali? 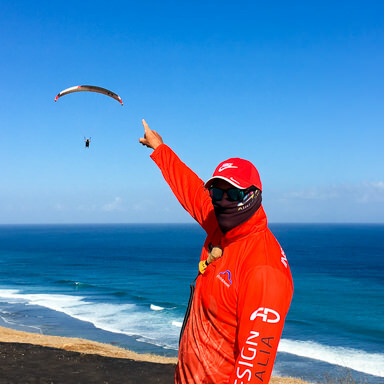 Whilst we have a totally boring winter in Australia, rendering training on the east coast of NSW very difficult, every year the trade winds kiss the coastal cliff-lines of Nusa Dua and provide incredible flying opportunities. The major benefit for you as a novice pilot is the amount of flying that you can get in. In most cases, you’ll double what would be possible on a course in Australia. This means you return to Australia as an extremely competent pilot. Some of the best students that we’ve ever trained have undertaken their student course in Bali. 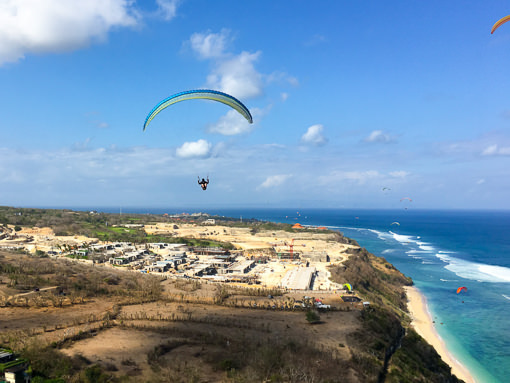 There’s something to be said about Bali’s great conditions day after day, and the opportunity to walk away with a truckload of top landings (landing where you’ve taken off from, and normally an intermediate skill! )under your belt isn’t too shabby, either! Our course is fun, family-friendly, and inclusive. Like anything in life; you get what you pay for. It’s that simple. We offer the absolute number one training option with low (max 6) and are the most experienced Australian training provider in touring Bali. You have our 100% undivided support and guidance. Anyone who knows how we operate in Bali will know that we don’t take risks, and our course numbers reflect our training ethos when at home – we are not a sausage factory. Small group training over large group training has its advantages. More 1:1 instructor time. More individually tailored, personal training and guidance. No waiting around on the hill for your chance to fly. Anytime it’s flyable, you’ll be filling your boots with airtime! *Get an incredible $1000 equipment voucher! Join our world famous paragliding tour and smash the flying hours!! Shop around and ask the big questions. Q: How many students will be on my course? A: With us, you will be on a course with a maximum of 6 students. Q: Are you running a tour at the same time? A: We don’t run a tour when we’re conducting student training ops. We want to give you 100% of our time to make you the best pilot we can and ensure you get excellent value for money. Q: Will I have to share equipment with anyone else? A: You will have your own rig to fly in Bali. No shareseys. Do your due diligence and ask how many years your instructor has been teaching and how many years experience their team has in Bali. Ours has a combined total of 30+ years instructing, and 44 years in touring Bali. We’re the experts. 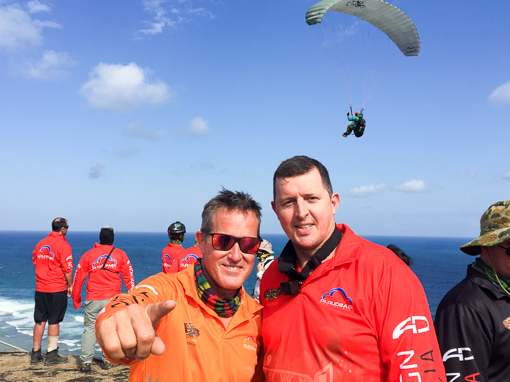 Can I join you on one of the tour weeks that follow my 8-day learn to paraglide course in Bali? You sure can! You’re more than welcome to book onto Tour #1 and continue your piloting development under the watchful eye of Chris, Mark, Geoff and Steve. You’ll make some friends for life and come home at the start of the Australian paragliding season, raring to go! Read about recent Cloudbase Tour participant’s experience with us in SkySailor magazine here and again here, and then in Aviator Magazine here! I’d like to purchase my own equipment from Cloudbase and bring it to Bali to learn on. How would that work? You’ll get a gob-smacking $1000.00 discount off equipment packages* purchased prior to Bali, plus you’ll also be entitled to claim the GST via the Tourist Refund Scheme. You’ll also receive a discount from us for training on your own gear! Ask us for more info. Yes. 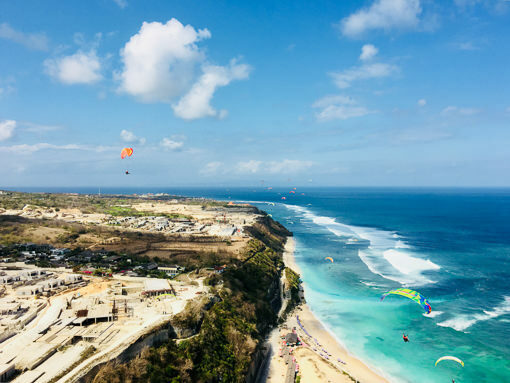 No matter whom you decide to train with in Bali, you will need to undertake a small portion of additional high flight training activity in Australia to fulfill HGFA licensing requirements. This is a mandatory requirement. Due to baggage limitations and the amount of equipment we already take to Bali, if you’re learning in Bali you must arrive with the equipment you will be learning on. We ship these items to you, and it is your responsibility to ship them back to us upon arriving home to Australia. 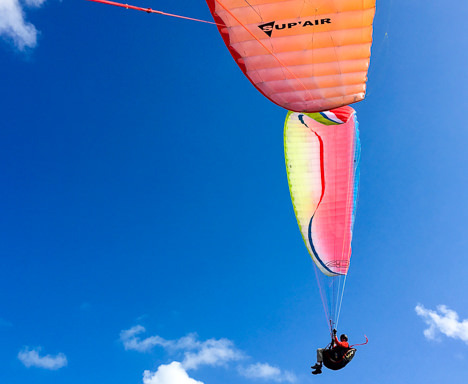 Learn on our BRAND NEW range of ultra safe and high performing AirDesign Paragliders. We don’t make you share equipment. You’ll have your own rig for the whole course. Course cost is $2100.00AUD. All equipment supplied Course outline located here. You must pay for the course 60 days in advance to secure your position on the course. You must arrive a day earlier than the course start date (19th July) so that you are fresh, relaxed and ready to fly. If you need transport from the airport, we can help you. We’ve always highly recommended Garuda Indonesia Airlines. They have a generous 23kg sporting goods allowance, additional to the 30kg check baggage for Economy class fares, and 40kg for Business Class fares. It has been the case in the past that what may appear to be a cheap ticket with Jetstar or Virgin may end up to be much, much more due to extra baggage charges. If you don’t account for these online, they pump you hard at the check-in counter, and before you know it, you’re paying an absolute packet. We get you to and from the flying site every day, but in the event that you want to go off and adventure by yourself, expect to pay up to $20AUD per day for a hire car, and scooter hire is anywhere from $7-$12AUD on average. We can organise all of your requirements cheaper than what you could normally as we have a local contact. All rooms are booked for the Swiss belHotel Segara for tour participants and the Rooms Division Manager will have a list of all rooms matched to tour participant names. This hotel is only 15 minutes drive from our flying site! This means you simply turn up with identification and your room is allocated to you with a smile. Easy. Our room rate of AUD$75p/n* includes breakfast and in-room WiFi, and we are proud to announce the following extras that the Swiss belHotel Segara have offered guests on our tour. This is a great hotel with extremely friendly and accommodating staff who make your stay very comfortable. Twin-share available. If you’re flying home to the eastern seaboard, it is a solid recommendation that you consider booking an extra day. The reason for this is that room checkout is 11am and your flight will be departing anywhere between 9pm and midnight. This gives you an opportunity to utilise your room for showers, or an afternoon rest instead of leaving your baggage at the bell desk and showering in the pool (which could be weird both for you and the kids with floaties). *The quoted rate and extras are for those booking and paying through us. If you’d like to book separately (direct to hotel), I believe the rate would be up to $10 additional per night, without discount offers. Don’t forget to register for the Tour Newsletter! You won’t find a better crew than Cloudbase! I had a great time recently with these legends in Bali. If you’re thinking of learning or doing a trip with them don’t wait any longer, they will have you enjoying the freedoms of flight in no time! I’ve been to Bali with the Cloudbase crew for the last couple of years and it is honestly the best thing that has happened for my pilot development. I’m a pretty busy guy with a young family, so the fact that Mark takes care of all of the organising and that these guys make the tour totally family friendly is a huge bonus for me. I come to Bali with a plan of what I’d like to achieve every year, and last year I worked on wingover progression with Mark in the tandem. This style of confidence building with direct guidance is excellent and I would recommend the tour to anyone wanting to evolve their piloting skill range. Chris and Mark are very competent instructors who run a great tour and treat their trainees and tour group members like valued customers. Mark and Chris run a standout tour. I would recommend this tour to anyone wanting to build skill and clock some serious airtime. The acceleration of your pilot skill development is so fast due to being able to fly every day. Getting guidance from the boys makes it excellent value for money when you learn so much. I met some great friends that I’ll have for life on that tour, and can’t wait to get my arse over there for this year. This was the single most incredible thing that I have done for my flying development since my student course. Mark and Chris helped me to achieve the skills I needed to progress to an Intermediate rating, and it’s the right amount of time to make everything click. It’s easy to see why people refer to this as ‘the tour’ to be on. Thanks boys, you definitely have Bali locked down! The support from Chris, Mark, Geoff and Steve is second to none. I arrived with very little airtime after my course in QLD and the boys looked after me like gold. I’d never done any top landings before, and it was great to have Chris and Mark’s voice constantly in your ear to ensure you’re safe. I left Bali a completely different pilot and came home to smash some great hours and now feel super confident. I’m going again this year! I have just arrived home from the Cloudbase Bali tour and still cannot wipe the smile off my face! I went to Bali as a new pilot with very little airtime – I was nervous, scared, didn’t believe in myself and had no idea what to expect from this trip. The level of experience and professionalism of Mark, Chris, Geoff and Steve made me feel safe and confident to try new skills and develop my flying skills. I cannot thank these guys enough for all the love and support you offered not only me but the whole group over the last week – I have walked away with so much confidence to head out and fly our local sites but more importantly my flying family has grown! I have had the best week with Cloudbase at Timbis. This was my third PG tour and my first with Cloudbase. It is definitely the pick of them. I had been told by a number of people how good the CB tours were however as always, another persons opinion is rather subjective and I was looking forward to finding out for myself. I went on the tour, as you know, with an all but brand new wing and was quietly confident in my abilities. Day one, I felt like a novice. Getting used to the Cloudbase way of doing things as well as all the help from the locals put me in my place. Not that it was a bad thing at all, just reinforced all the bad habits I have picked up over the last couple of years. Looking back on the week as I fill in my logbook, I can see how much I didn’t know. I have learnt more about my flying in the last week than I have in the last 18 months. The depth and breadth of instruction from your team is mind-blowing. At no stage did I feel like I was asking too many questions nor at any stage did I feel like an outsider. The family feel of Cloudbase is phenomenal. I went to the tour feeling like a customer and have left feeling like a friend. The work you have put into your business really shows. Whilst I can never redo my initial training, knowing what I know now, if I had started with CB, I believe my skill set would be a lot higher. I would like to thank yourself, Chris, Steve and Geoff for a wonderful experience and the best instruction I have ever had in paragliding. After doing the Bali Tour in 2016, I was addicted to the sense of camaraderie that Chris, Mark and the team project. Not only do you have the perfect balance of professionalism and wisdom, but you can expect to be welcomed into an awesome family of friendly, like-minded adventurist pilots. These guys are top! I got much so flying time in while I was in Bali it was ridiculous. Great times in a relaxing atmosphere. Thanks for such great memories and nights out! I had a fabulous time! Best part for me was racking up the hours to develop myself enough to obtain my intermediate rating and learnt how to safely and competently fly a mini wing. Want updates? Subscribe to the Tour/Courses Newsletter!